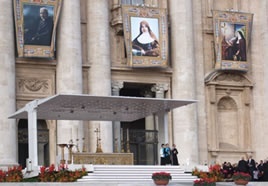 Mary MacKillop was canonised on October 17, 2010 at Saint Peter’s Basilica, Rome. 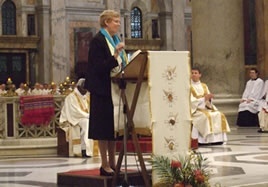 Pope Benedict XVI proclaimed Mary’s sainthood during a Canonisation Mass. Over 8000 pilgrims from Australia and New Zealand attended the ceremony. The Church does not make a saint – it recognises a saint. Canonisation is the act by which the Holy Father declares in a definitive and solemn way that a Catholic Christian is actually in the glory of heaven, intercedes for us before the Lord and is to be publicly venerated by the whole Church. They are as much a part of the canonisation as the person who is being recognised. Many beautiful and inspiring words were spoken by Church leaders during the Canonisation of Mary MacKillop and the surrounding events.